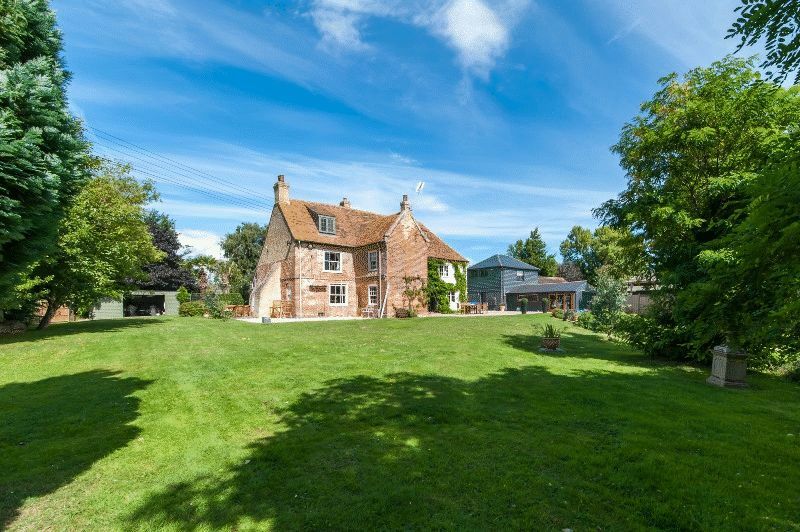 Once described by The Telegraph as 'Property Wreck of the Week', Kings End Farmhouse now stands beautifully proud displaying the years of hard work culminating in this now, stunning and enchanting farmhouse. 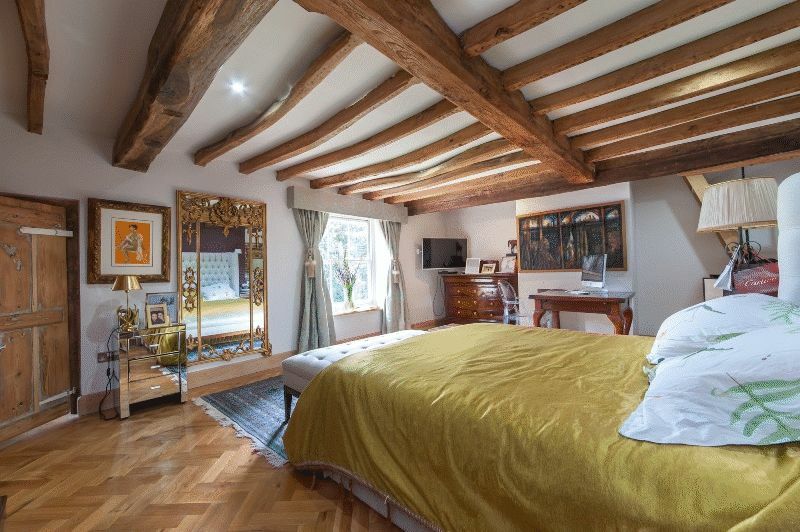 Grade II Listed and believed to date back as early as the 15th century, the house was subsequently gentrified in the 17th century. 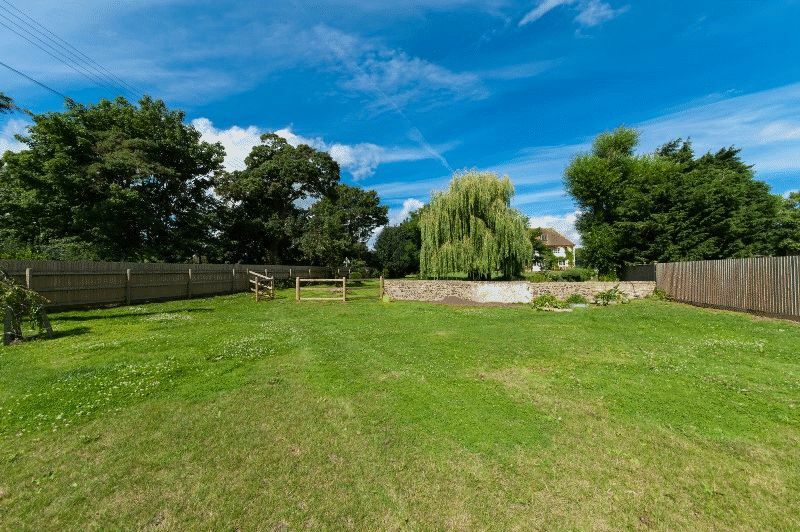 Set within approximately 1 acre of finely manicured gardens, including a paddock, the first noticeable feature of the property is the impressive catslide roof. 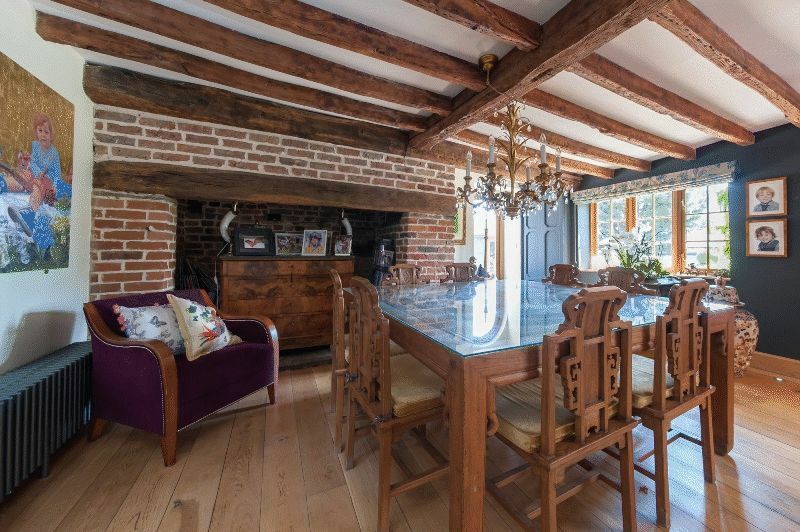 Internally, the house does not disappoint and maintains a wealth of renovated period features with inglenook fireplaces, oak flooring, traditional wooden latched doors, exposed timbers and vaulted ceilings. 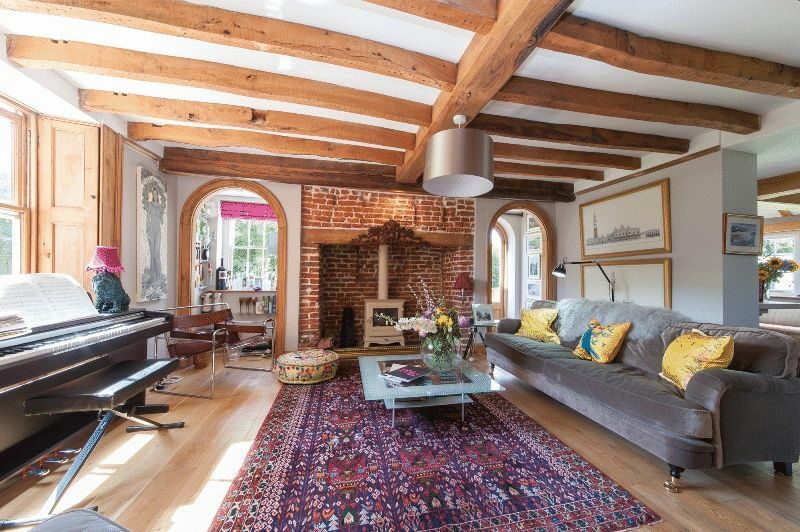 With a wonderful diverse mix of contemporary with period, there are high vaulted ceilings with glass panelling and heating via Bisque radiators. 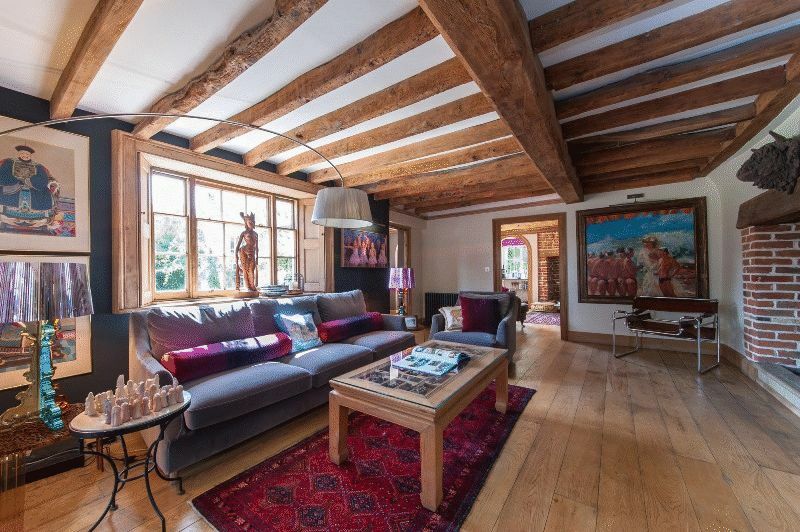 The generous sized family room enjoys views across the sun terrace and gardens with a further snug/sitting room, study, kitchen/breakfast room, wet room and boot room on the ground floor. 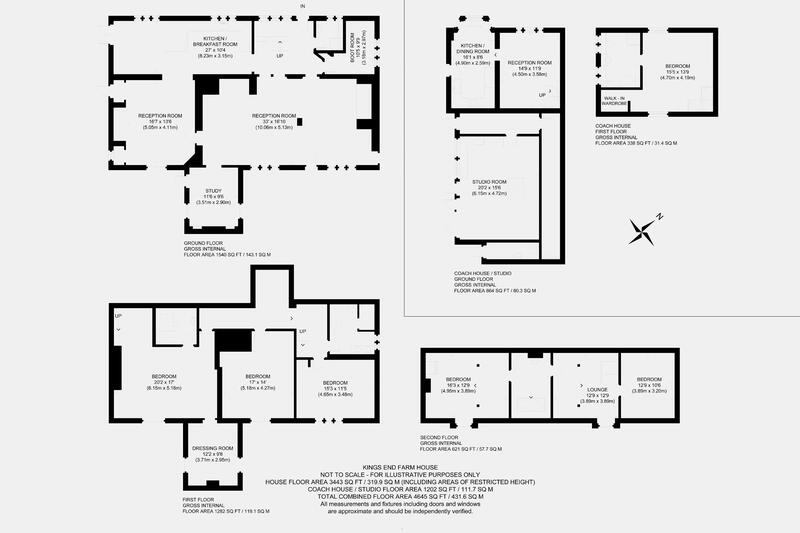 The first floor accommodates an impressive master suite with separate dressing room and spacious En-suite shower room with two further good sized bedrooms and a family bathroom complete the first floor. 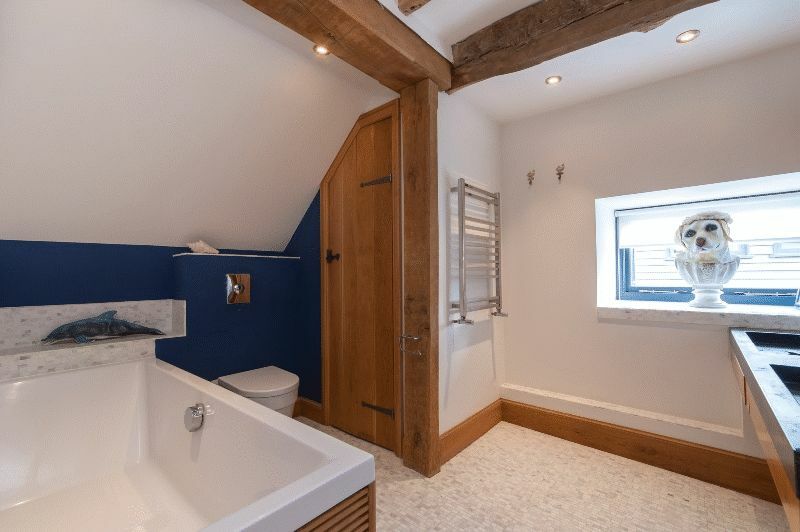 The vast attic space has been converted to provide two further bedrooms, a snug/sitting area and a Jack-and-Jill bathroom incorporating a wonderful large Corian bath. 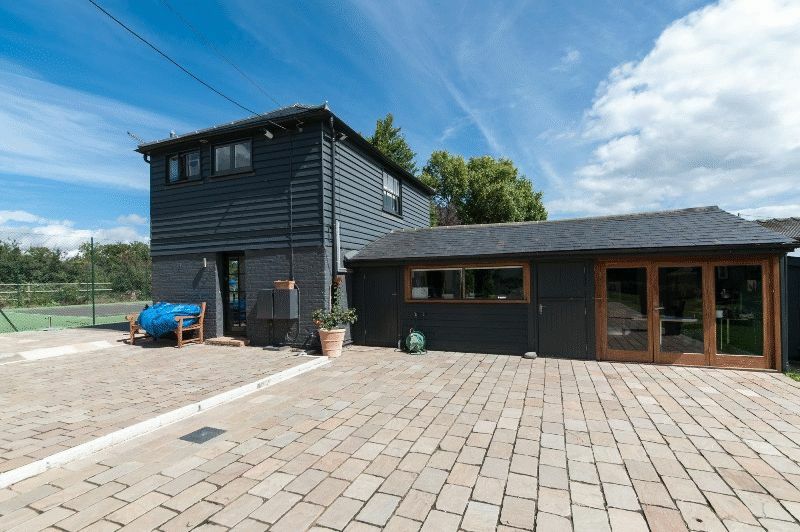 In addition to the main house, there is a stunning, self-contained one bedroom Coach House, ideal for extended family members or perhaps a rental opportunity. 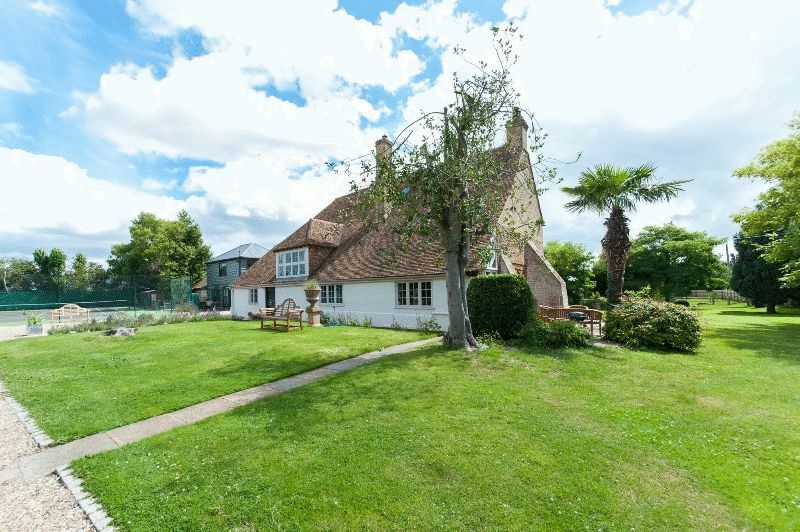 Attached to the Coach House is a further good sized office/utility room/games room. 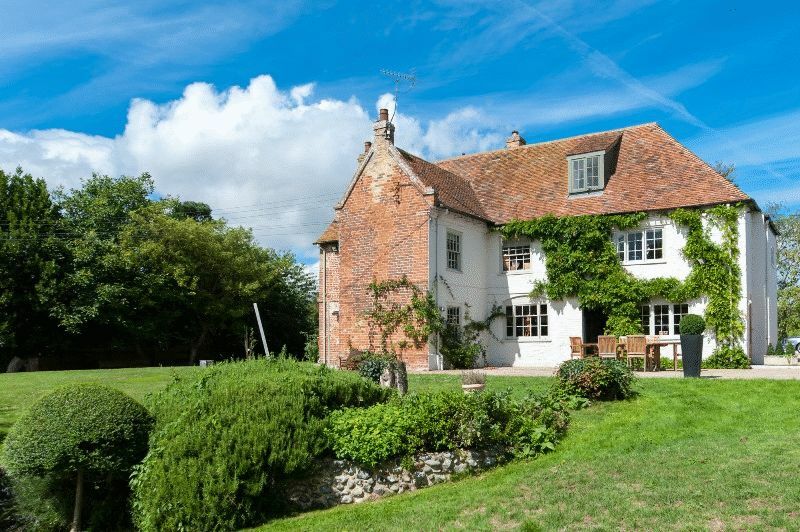 Kings End Farmhouse is surrounded by farm land, and is a stones throw away from Richborough Roman Fort and Amphitheatre. The Cinque Port town of Sandwich is approximately 3 miles distant and offers a range of amenities including supermarket, shops, banks, post office, chemist, doctor and dentist surgeries, restaurants, public houses, choice of schools and leisure facilities, with a mainline station having high speed services direct to London St. Pancras and frequent trains to London Charing Cross. Sandwich is also well known for its golf courses with Royal St George’s which will host the 149th open in 2020. 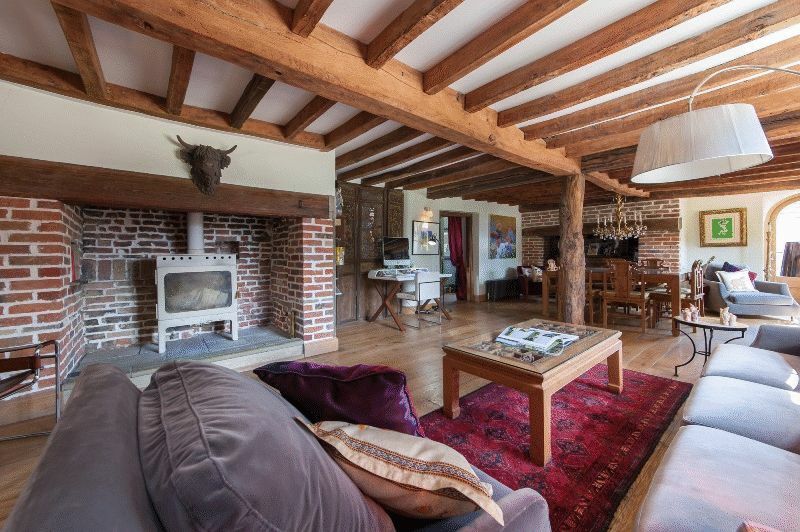 Oak flooring, exposed timbers, two inglenook fireplaces, one of which incorporates a log burner, two windows to rear, external rear and side door. External door to side, double aspect with windows to side, brick fireplace with pine surround, inset shelved pine recesses. Shower, part-tiled walls and low level WC. L-shaped with window to side. 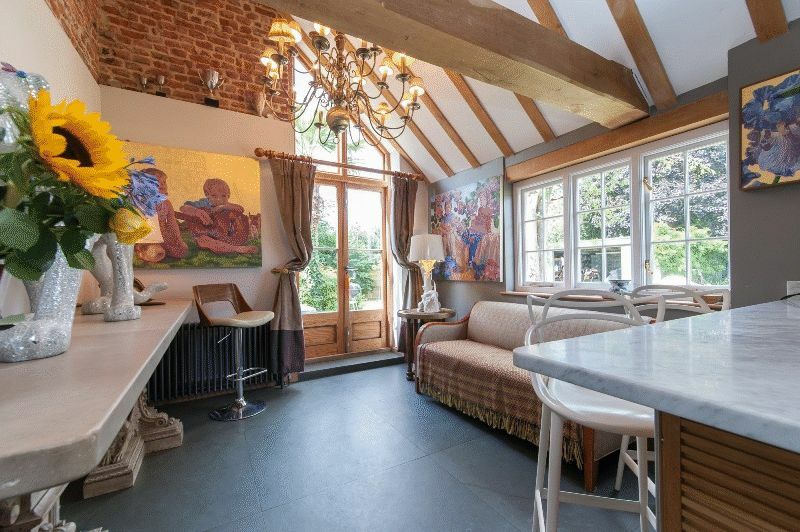 Double aspect room with sash windows to both sides, wooden parquet flooring. Double marbled tiled shower cubical with Bisque shower base, low level WC with concealed cistern, marble flooring, marble wash basin, recess shelving and Velux window to front. Sash window to rear, wooden parquet flooring, brick fireplace with bressummer beam over, painted oak panelling to walls. Window to rear and oak flooring. Double limestone wash basins, mosaic wall and floor tiles, bath and low level WC, window to side, cupboard housing Megaflow water tank. (Measurements taken at waist height) With sloping ceilings and Velux window to side. (Measurements taken at waist height) Vaulted ceilings and Dorma window to rear. 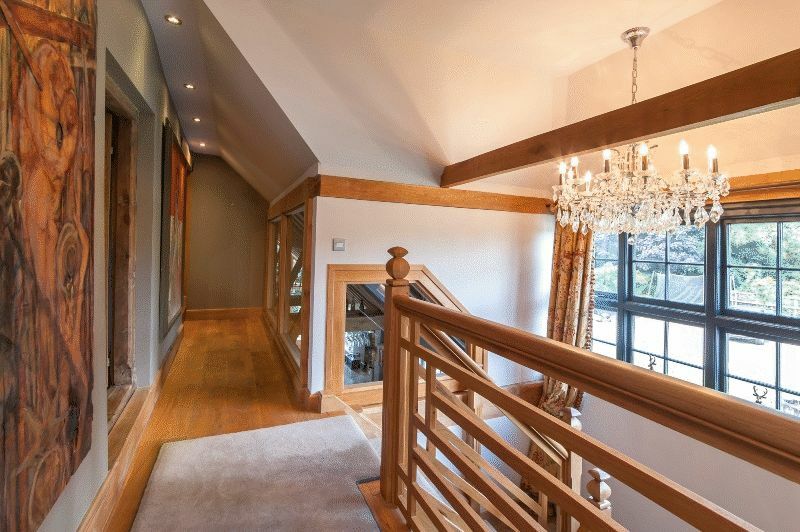 Oak flooring, sash window to front and spiral staircase to first floor. Double aspect room with sash windows to front and rear, oak flooring, further walk-in recess with hanging, shelving and storage. Worcester boiler. Bath with shower attachment, low level WC, marble tiled shower cubical, oak flooring, two windows to side and loft access. 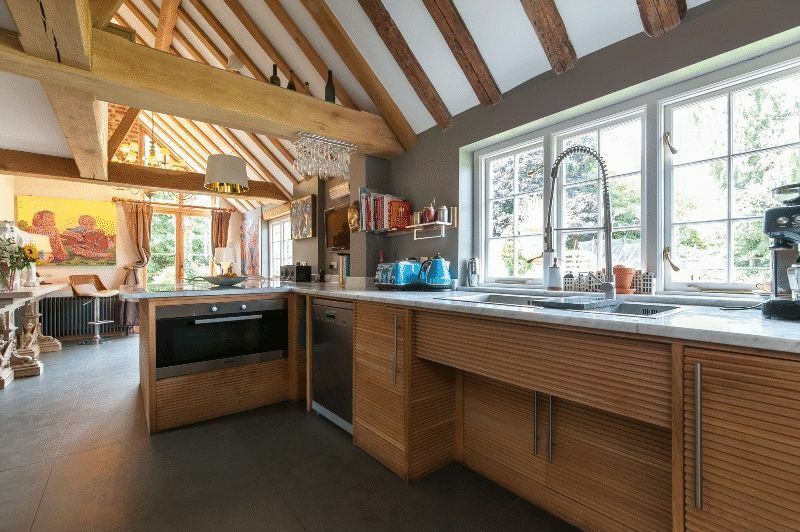 Velux to side, work surfaces with space and plumbing for washing machine, tumble dryer etc. Stainless steel sink drainer, wooden effect vinyl flooring, full length glazed windows and door to side. Further external side door and internal door leading to a lobby and storage area with shower cubical. 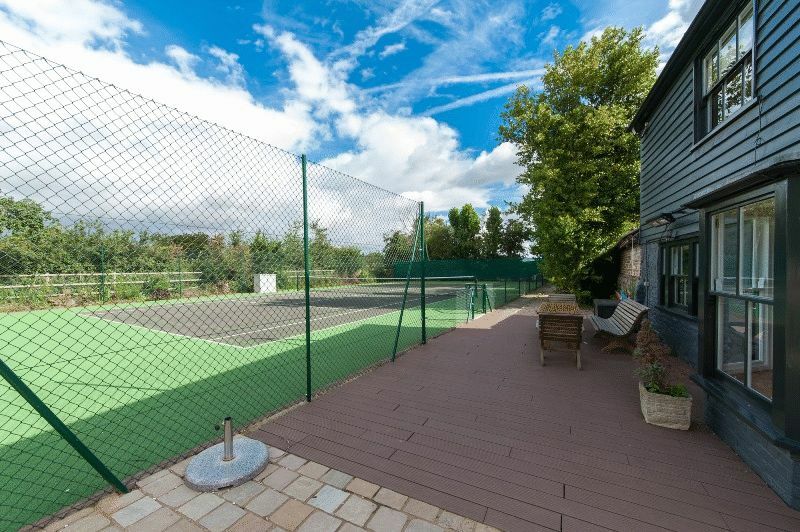 The property sits in grounds of approximately 1 acre, which include a paddock and a tennis court. There is an attractive paved sun terrace/patio immediately to the rear and side of the property. 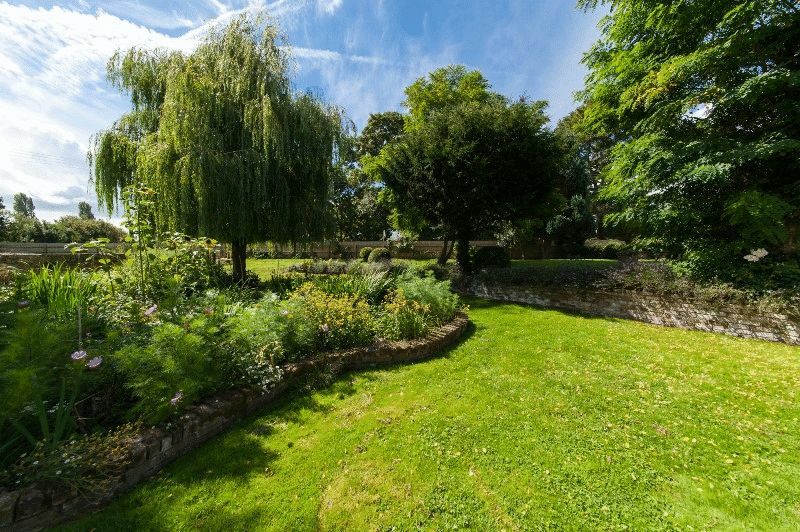 The gardens are beautifully maintained and are mainly lawned with attractive established flower, tree and shrub borders. Outbuildings include one stable and two storage sheds. There are double wooden electric gates with a gravel driveway allowing ample off-road car parking.